Enough sweet potato vines to fill the sink. I had no idea one could eat sweet potato vines until earlier this year. Like every good European gardener I knew that every part of the regular potato above the ground was poisonous and just assumed the same was true of the sweet potatoes. How wrong I was! From back to front; pock Marked Mother Chen’s Bean Curd, Steamed Eggplant with Chile Sauce, and stir Fried Sweet Potato Vines. When we got sweet potato vines in the pick box this week I immediately thought about a Chinese stir fry but I also wondered whether they were eaten in Africa as well. 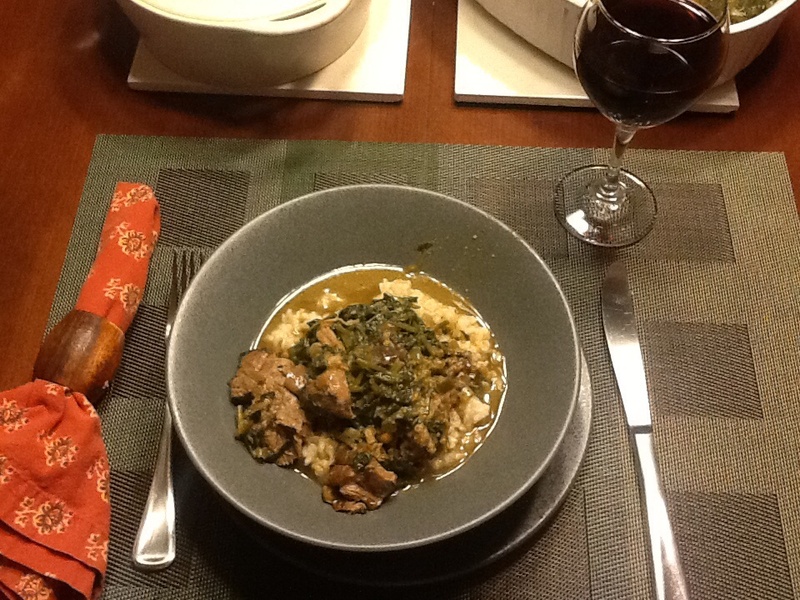 We tried Frog Song’s vines in a stir fry from Katie Cannon. 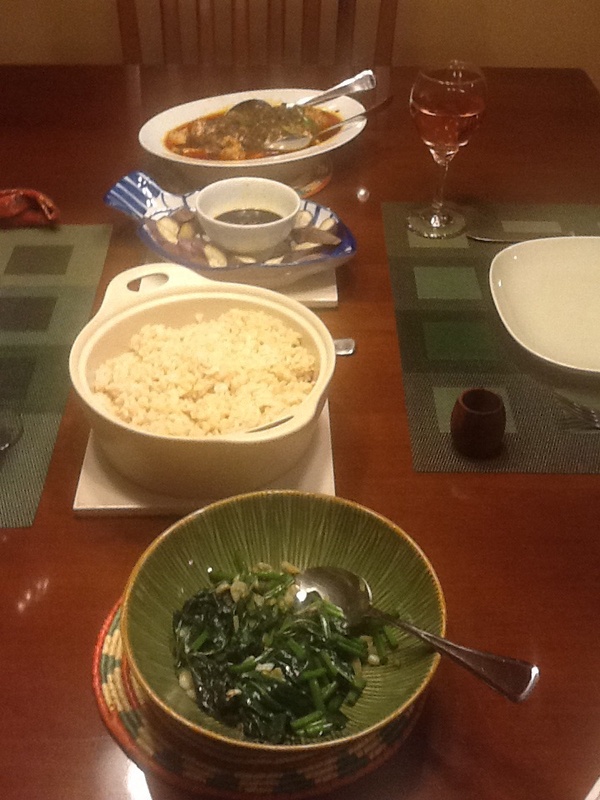 We had them with brown rice and Fuchsia Dunlop’s Pock Marked Mother Chen’s Bean Curd (Ma Po Dou Fu, sounds better in Chinese doesn’t it, but delicious in any language) and her Steamed Eggplant with Chile Sauce that I mentioned in an earlier post. But I have to say, the addition of the fish sauce did not make this a Bethany favorite. Just a bit too pungent. Next time I will stir fry them in a hot and garlicky sauce. Getting the vines from Frog Song made me look at the vines in my own garden, which at this time of year are rapidly taking over. So I send Bethany out to bring back a laundry basket full of vine clippings (I kid you not) and began preparing a version of this recipe. I couldn’t get goat, so I used lamb, find a nice fatty cut. I also didn’t pound the leaves, just cut them and I didn’t cook the leaves for so long. No need to boil them to death, they will meld in the stew nicely enough. Finally, I just used a few fried anchovies instead of making a fish stock. Also, note in the recipe at Shepherd’s Song the cooked leaves are “set aside” and, as far as I can tell, never make it back into the stew! 2lbs lamb shoulder chops, or neck. 2 tbsps of canola oil. 1 half large onion, diced. 2 dried chilies, I used arbol. 3 anchovy fillets, packed in oil, finely chopped. 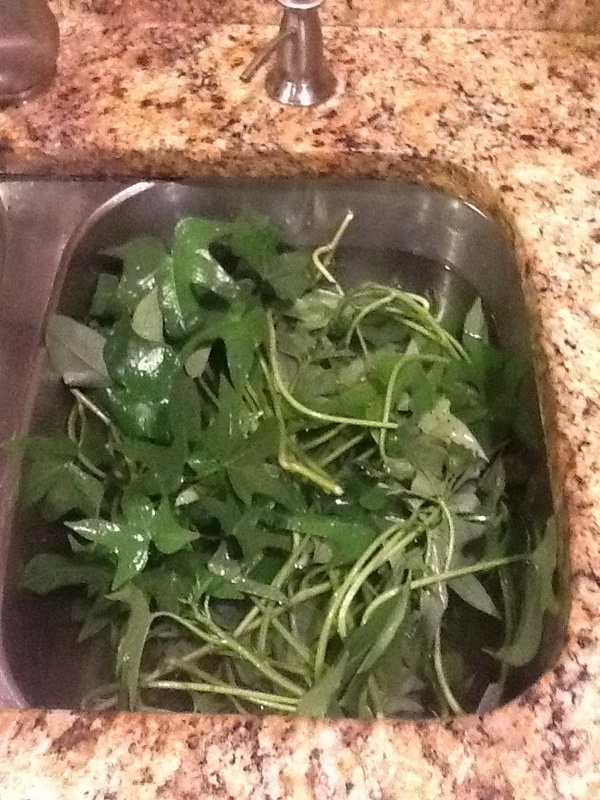 A large amount of sweet potato leaves, chopped. Preheat the oven to 350 degrees. Bring a large pot of water to boiling. In the meantime, brown the lamb chops in the oil until nicely browned on both sides. Remove from the skillet and place in the bottom of a casserole. Add the diced onion, the anchovies, garlic, and eggplant to the remaining oil and brown. Grind one chili and add it to the onions. Add the spring onions. Place the chopped sweet potato leaves in the boiling water and cook until bright green. Remove from the water and place in the casserole on top of the meat. Then place the browned onion mixture on top of that. Season the whole thing generously with salt and pepper. Add the second chili, whole. Add enough of the water from the vines to almost, but not quite cover the meat and vegetables. Mix the peanut butter with another half a cup of the cooking water and add that to the casserole. Cover and bake in the oven for approximately one hour. Remove the casserole from the oven. Fish around in the stew to remove the chops. The meat should easily fall away from the the bone and remaining fat. Return the meat to the stew, stir and adjust the seasoning. Serve over brown rice. We drank a Californian Pinot Noir with it, but you could choose a more full bodied red.